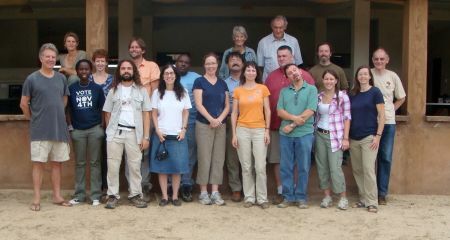 The ninth annual Stony Brook Human Evolution Workshop, “Our ancestors’ ancestors: the Miocene roots of the hominin tree” took place in Kenya, August 17 – 21, 2010. The event gathered 18 researchers from around the globe for a private retreat at the Turkana Basin Institute’s Turkwel research facility to examine the Miocene epoch in the context of human evolution. The aim was to discuss all relevant fossil material and paleoecological data and attempt to identify key events in hominoid evolution, from the origin of the clade to the divergence of our own lineage. The workshop began with a welcome from Richard Leakey (Stony Brook) and brief introductory remarks by TBI Director, Lawrence Martin. Participants were encouraged to spend the rest of the day settling into their newly constructed guest cottages, observing ongoing construction of a new research laboratory, and exploring the vast wilderness just outside the boundaries of the station. The luxury and comfort provided by TBI in such a remote region is nothing short of miraculous. In the opening session the following morning, participants described their previous research, current interests, and future projects as they relate to the Miocene. Next, the group established a working phylogeny of Miocene fossil taxa and extant hominoids. Although a consensus could not be reached for several taxa, this served as a framework for the more detailed discussions that followed. Additionally we agreed upon terminology for the different clades we would be discussing as a means of dispelling confusion later on. For the purpose of our workshop, “hominoids” referred to all apes, “hominids” to all great apes, “hominines” to the African great apes, and “hominins” to chimps and humans. Participants in the ninth annual Stony Brook Human Evolution Workshop. Throughout the remaining sessions, workshop co-organizers James Rossie (Stony Brook) and David Begun (University of Toronto) guided participants through a series of questions aimed to highlight important issues during each time period of the Miocene. We were encouraged to discuss our interpretations of the current fossil material and asked to identify the types of evidence necessary to help resolve the central debates of each era. The Early Miocene session began with a desire to establish the true synapomorphies of the hominoid clade. While postcranial features related to suspension are often cited in this respect, the group determined that the extremely specialized suspensory behavior of each of the modern taxa may not be representative of their last common ancestor, and therefore focused on morphological characteristics related to orthogrady instead. These included but are not limited to an intermembral index over 100, a broad thorax with a relatively short lumbar region, a globular capitulum and deep zona conoidea creating a stable elbow, a moderate degree of humeral head torsion, anterior concave curvature of the distal half of the humeral shaft, and a reduction of the ulnar styloid. Following this consensus, taxa between 22 and 17 million years old were up for discussion, but the main subject of interest was Proconsul. This genus has long been the subject of debates regarding its phylogenetic position, taxonomy, and positional behavior. As participants passed around P. heseloni’s tiny distal sacral element to look for evidence of a tail, they invoked the old adage, “absence of evidence is not evidence of absence.” Though some do not believe this bone to be able to support a tail, others argued that carnivore damage to the rest of the skeleton could explain the tails’ absence from the fossil record. An examination of the evidence for the diet of Proconsul quickly paved the way for a debate over the purpose of thick versus thin enamel, with some suggesting there is a lot of variance in enamel thickness and it is most likely an ecologically influenced trait rather than a phylogenetic signal. When asked about the relationship between Afropithecus and Morotopithecus, participants verified the generic distinction between the two based on molar morphology. Their similar facial morphology and upper dentition however, suggest these genera could be part of the same grade shift from earlier taxa such as Kamoyapithecus. As we entered the Middle Miocene and attempted to name the oldest hominoid of this age, a noticeable gap in the fossil record was evident. At this time we see the first appearance of hominoids in Europe at around 16.5 Ma, however the lack of comparably aged sites in Africa makes theories surrounding the origins of the European taxa extremely difficult to test. Though heavily debated, the group was ultimately unable to ascertain discrete differences between Kenyapithecus, Griphopithecus, and Equatorius. The group could agree however, that the taxonomic argument is secondary to the fact that all three taxa are derived compared to Early Miocene apes and most likely represent a radiation of a new kind of hominoid. The beginning of the Middle/Late Miocene session focused on a group of European genera present at this time. Participants agreed that Pierolapithecus, Anoiapithecus, and Dryopithecus are all hominids which are derived from other Middle Miocene taxa in having a broad nasal aperture and high zygomatics. However, they do differ in other aspects of their facial and nasal morphology, thus validating the generic distinction. We discussed the postcrania of Rudapithecus and Pierolapithecus as it influences positional behavior. The modern morphology of the distal humerus and dorsally oriented pelvis of Rudapithecus suggest an orthograde body plan. Similarly, Pierolapithecus exhibits posteriorly placed transverse processes on the lumbar vertebrae, a long robust clavicle, and curved ribs, with additional features indicating capabilities for above branch power grasping. We were on the fence as to whether these European apes were representative of the lineage leading directly to the extant great apes or a separate radiation of large bodied orthograde animals who lacked the specialized suspensory behaviors we see in modern taxa. Once again, deficiencies in the African fossil record, this time from10to 12 million years of age were cited as the major problem in attempting to resolve this issue. The group spent the second half of this session discussing younger, more fragmentary specimens from the Late Miocene and their possible relationships to extant great apes. One researcher presented evidence that Nakalipithecus might be a gorilline based on enamel thickness and enamel-dentin-junction morphology. If so, this would be good support for gorilla branching by 10 million years ago. Participants also examined several specimens of Ouranopithecus while hypothesizing about its phylogenetic position. Derived features of this genus include canine reduction, thick enamel, enlarged molars, spatulate lateral incisors, and a flat mandibular condyle, though it was later suggested by some that these features could simply be homoplasies which are part of a single functional complex. Assessing the nature of the last common ancestor (LCA) of chimpanzees and humans was the primary goal of the End of the Miocene session. To begin this task we discussed the hominin status of Sahelanthropus, Orrorin, and Ardipithecus, as well as the evidence for bipedalism in each genus. While nothing new was gleamed from the Sahelanthropus skull or Orrorin femur, we did agree that these taxa lack sufficient material to be confidently placed in the hominin clade. Ardipithecus was discussed at length, but with relatively little data and only a few participants’ experience with casts of the material, we were careful not to make any definitive conclusions. However, we posited that its postcranial morphology supports orthograde clambering with much of the body weight born on the hind limbs. Interestingly, this is similar to the locomotor behaviors interpreted for Oreopithecus. The participants concluded that as a whole, this group of genera could likely represent early experiments with different forms of bipedalism without their having any direct relationship to subsequent bipeds. As far as the chimpanzee and human LCA is concerned, there seem to be two equally unparsimonious scenarios. If the LCA was a suspensory creature, it would have had to undergo numerous reversals, including elongating the trunk, widening the pelvis, and readjusting limb proportions, in order to become bipedal. On the other hand, if the LCA was non-suspensory, then independent evolution of suspension followed by knuckle-walking would need to have occurred in both chimpanzees and gorillas. We discussed some of the problems with these scenarios and put forth the idea that the LCA was likely an orthograde clamberer who engaged in suspension but was not as specialized as extant taxa, perhaps due to smaller body size. In the final session of the workshop, participants were asked “What does the Miocene record inform us about the events happening on the hominoid lineage?” We know that at some point, features relating to orthogrady, but not necessarily suspension began to appear. After the split of gibbons, we see an increase in encephalization, decrease in life history parameters, large premolars, stepped subnasal morphology, reduction/loss of cingulum, higher and vertically oriented zygomatics, complete separation of the ulnar styloid and triquetrum, and more robust carpals. With the preponderance of fossil taxa represented only by dentition, cranial fragments, or partial skeletons, it is difficult to determine the exact sequence in which these traits evolved. One lingering issue that persisted throughout the workshop was how little we know about gibbons when they are the most problematic in determining the phylogenetic position of fossil taxa. Without gibbons, majority of the Early and Middle Miocene species fall nicely into line according to craniodental features. This led us to question whether the hominoid synapomorphies we came up with in our first session are legitimate, or if they are simply homoplasies due to convergent evolution of similar locomotor and positional behaviors. And, if this is the case, that gibbons evolved their derived postcrania independently, then they could have evolved from almost anything in the Miocene, including Proconsul or the small bodied apes such as Dendropithecus or Micropithecus. It would be worthwhile to investigate the genetic basis for development of these postcranial features to determine the likelihood for them to have arisen in parallel. In closing, Richard Leakey addressed what he feels are the most pressing issues for this area of research. He would like to see more ecological data, as the environment is directly responsible for influencing the morphologies we use to describe relationships between taxa. He stressed the importance of exploring untapped fossil sites from this time period and continuing to seek out new pieces of evidence, asserting “We’re responding to what we find, rather than trying to find what we need.” One comment that resonated with all of us was the need for Miocene research to become more prevalent within universities and among students. 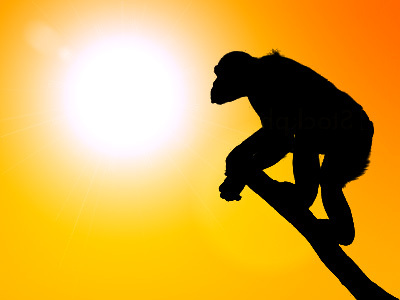 He suggested that the further back in time we as researchers push human evolution, the more it solidifies to the public our links to living primates whose lineages also originated in the Miocene. Attending the workshop at TBI was a very pleasant and exciting experience for me. Despite the considerable disagreements that still remain among researchers regarding the details of hominoid evolution and phylogeny, the atmosphere of the informal sessions was very positive, and all the researchers were very open-minded towards hypotheses alternative to their preferred ones. I’d like to thank the Leakeys for their hospitality, to which the workshop’s success must be attributed to a large extent. It was a wonderful meeting, yet it’s impossible to rank-order the quality of the scientific discussions, the splendor of the landscape, or the delightful surprises emanating from Richard’s kitchen! I treasure my memories from Turkwel, and have encouraged my students to take advantage of the unique opportunities available through the TBI. I think it went extremely well and on a personal level it was extremely productive and informative. I have even changed my mind about certain aspects of the taxonomy of Spanish dryopiths. There are still interesting differences of opinion that I look forward to discussing in more detail with our Spanish colleagues. I think we also made real progress on the significance of the middle Miocene, even if there was not complete agreement, and on homoplasy in hominoid evolution. A tremendous amount of information, quite a bit unpublished, was shared freely. Our final discussions on knuckle-walking, Morotopithecus, hylobatids and postcranial homoplasy were especially interesting to me, and I continue to think intensively about it. As one of the organizers, I was thrilled with the participation of everyone, the free and open discussions, and the civility of the event.